You can’t beat a good hot cross bun – especially all warm and toasty with butter and a great big chocolate egg on the side (you can get away with that at this time of year) – and so I thought this year I’d make my own. Not content with this challenge (I’ve never made anything remotely bready before), I also decided normal hot cross buns are for wimps, and mine needed to be different. So I tried to make them softer, with custardy influence and a hint of apple to go with the sultanas and cinnamon. Sounded nicer in the planning stage. Here’s what I did (with all the bits that went horribly wrong edited out, clearly.) I should point out that I am absolutely indebted to Domestic Sluttery for the majority of this method, so you all need to tell Alexthepink how amazingly cool and cook-savvy she is. I bet she didn’t mess up half as much as me. 1. Mix the milk and cream in with the egg and set aside. 2. Get a massive bowl and shove in the yeast, salt, sugar, custard powder, cinnamon, nutmeg, and butter. 3. Make a well in the centre of the mixture (thank you, Domestic Sluttery! Makes things much easier) and pour in the milk a little at a time, beating it into the mix with a wooden spoon. When you’re done it’ll be all sticky. 4. Flour a worktop/chopping board and your hands, and then knead the dough on it for about ten minutes, until it is springy and smooth. Particularly good when listening to Arsenal play Spurs on the radio. 5. Pop it back in a bowl and cover with clingfilm. Leave it to rise for about an hour, or until it doubles in size. Weep bitterly in a corner while Spurs equalize from 3-1 down. 6. Grease a couple of baking trays, and preheat the oven to 200 degrees. 7. Knead the dough for a few minutes, until it’s back to its original size. Knead in the apple and fruit as you do so. 8. Divide the dough into 12-16 buns and put on baking trays ready to cook. Leave lots of room as they’ll get much bigger. 9. 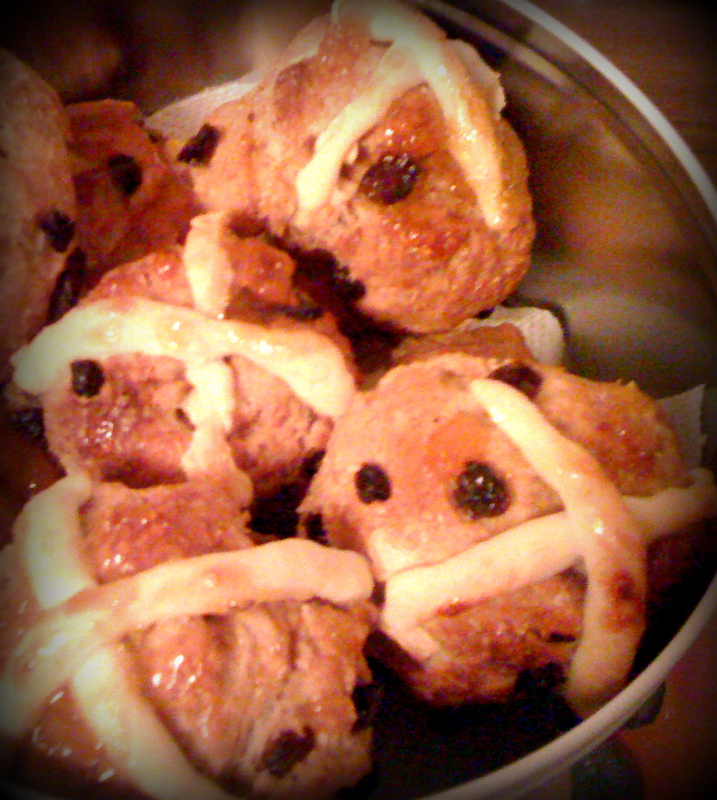 Leave them to rise again while you mix the ingredients for the crosses into a pipeable paste. The best thing to do is use a piping bag to apply the crosses. I didn’t have one, and used Alex’s clever tip to use a sandwich bag, but I managed to make a massive mess and ended up with the pretty stupid last resort of rolling the paste into thin sausages between my palms. That’s why my crosses look ridiculous, so yours should be much better. 10. Bake for 15 minutes while warming the jam in a saucepan, then take them out to brush on a glaze. Bake for a final five minutes. 11. Leave to cool if you can bear to wait. I personally tucked straight in while they were warm, with butter and rhubarb jam. NOM.